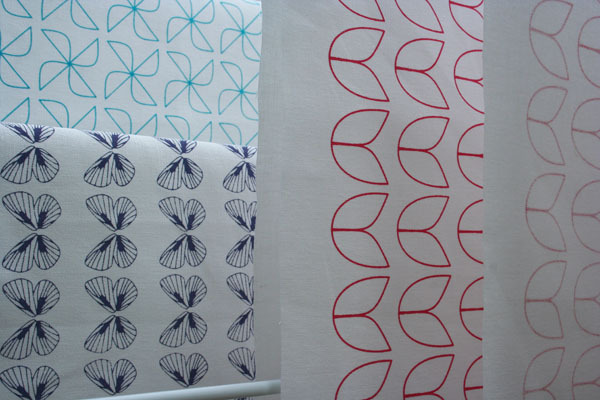 I’ve had a very productive morning, printing strips of fabric to make into lampshades. These are for a gallery in Leeds called The Bowery who asked me to supply them with some of my handmade lampshades. I’m really excited about this opportunity to see some of my lampshades and gilhoolie patterns in a gallery. I decided to go for a deep pink for the tulips, a dusky purple for the butterflies and a bright turquoise for the windmills. The only problem is I never seem to be able to screen-print without holding my breath in case I mess up! I’m sure there must be some breathing techniques I should practice… All done now, just the lampshades themselves to make. And breathe….